Did you see this? "Welcome to the new world. It's just changed for you Christians. 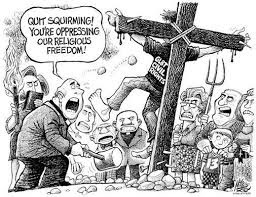 You are going to be persecuted according to the U.S Supreme Court dissents," said Alabama Supreme Court Chief Justice Roy Moore. The man who shouldn't sit on any judicial bench anywhere, except maybe Taliban-occupied Afghanistan. No church will be forced to marry people they don't want to. My church will continue to hold weddings for members and their families, gay or straight, and require extra steps for folks who've been divorced. My church won't be forced to start holding weddings for couples who just walk in off the street and say "how pretty! We want to stage our colossal wedding extravaganza here! ", and other churches won't be forced to marry gay couples. Why don't we start a campaign to remove the tax exempt status and other special privileges for churches that do not accept the Supreme Court's decision?